This feature of the grade book allows teachers to enter scores based on a raw number of points possible and have those scores scaled up to a new value. For example, let's say you give a quiz with only 8 questions.To simplify the grading, you score each question as 1 point but you want to make the quiz worth 25 points for the purpose of calculating student grades. Click here for more information on Scaled Scores. 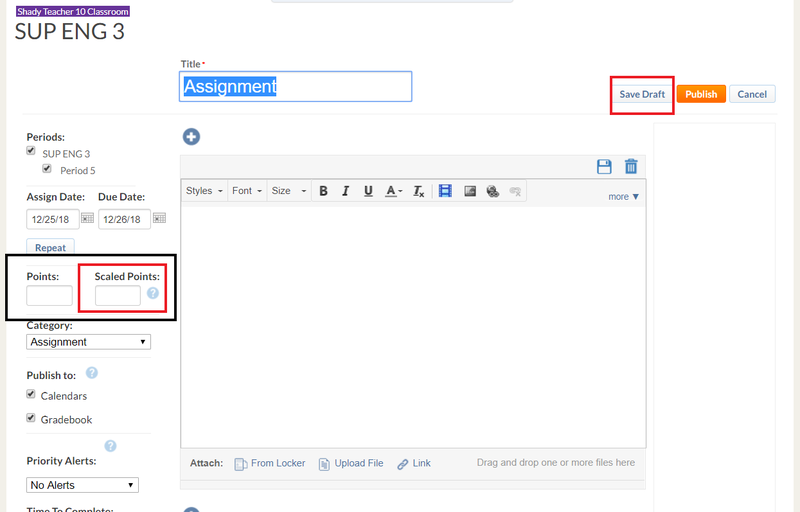 Click on Assignment as shown in the orange button. Select a class from the drop down menu. On the left hand side, locate the Points and the Scaled Points section. NOTE: If the Scaled Points value in the screenshot above had been 4, then a student with 100% correct would receive a score of 4/4 for the quiz. Enter a lower value for the Scaled Points. NOTE: Don't try to scale scores down to zero - this figure does not work. Click on Save Draft so the scores are saved and you can Publish it later when all the inputs are entered into the assignment. Once a lower value is entered (other than 0) for the Scaled Points, the edited value will now reflect in the Scaled Points section.